The most exciting part of the March 2nd keynote was not the introduction of the iPad 2, but the introduction of its surprise accessory that makes the iPad 2 twice as magical as its predecessor. Approximately twenty-five minutes into his speech, Steve Jobs broadcasts signals of pure excitement. Suddenly the mediocre announcement of the Digital AV Adapter was transitioned into what might have as been Job's, "One last thing." With the unveiling of the Smart Cover, Jobs hadn't yet looked so happy in the keynote. Clearly, this was something to pay attention to. This is probably the most genius accessory for any product I've seen in a decade. Not because it's done by Apple or made for the iPad, but because it's the only accessory I know of that makes its parent product so desirable. The effect that the Smart Cover has on our perception of the iPad 2 is outstanding. Right now, can you think of the iPad without a Smart Cover? I can't. When we start thinking about the Smart Cover, you have to think about how Apple loves to show off their products. Everything from the iPod nano to the iPhone 4 is showcased naked, either off the sleeve of a gym top or in the palm of our hands. But even with Apple's bumper for the iPhone 4, they simply refused to cover the entire back of the iPhone -- its beauty is meant to be displayed. Then you start to remember why Apple pulled protective films from their Apple Stores. They want to drive home to customers that you don't need the protection you think you need. 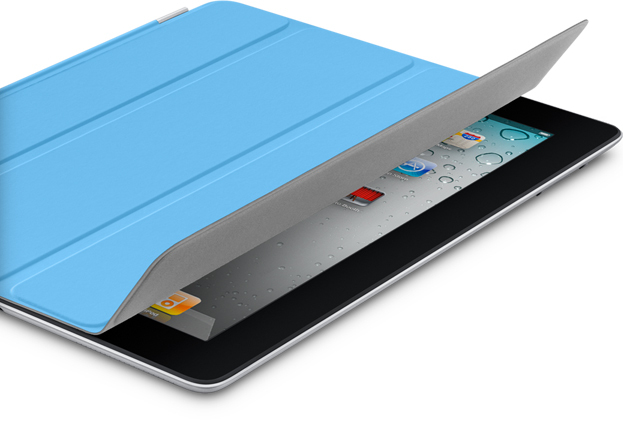 The Smart Cover adds utility to the iPad 2, but it doesn't detract from form or function. The first iPad case sold by Apple was quite frankly a mess, and you'd never think Cupertino would put out such a cheap product with a crimped edge. Numerous complaints discussing the case's tendency to rock while standing the iPad, to not being able to use it with any of Apple's dock accessories, and its tendency to wear poorly over time have been addressed by removing the components that caused these issues. Gone is the skintight bodysuit that was a struggle to apply and remove. Abandoned are flaps and latches to configure the iPad on wobbly panels. All that remains is the most important piece: the cover. I believe a tablet should be unhindered by its case. Many people aren't like me, and would prefer to add several millimeters of leather or plastic to their aluminum tablets. While I don't have an excuse for touting the rather thick Saddleback in public (I'm such a showoff), or MacAlly's Bookstand at movie time, manufacturers have devised dozens of ways from plungers to leather folios to address our adjustment to tablet computing. I've never been one-hundred percent satisfied with anything that's currently on the market, though I still value both the fashion and attempt to personalize our most intimate device. With the Smart Cover, my search for the perfect case ends. Manufacturers in the past wouldn't have been able to provide only a cover without Apple's current implementation of magnets in the iPad 2. As a bonus, the whole selling point of a case is to protect your iPad from "dings or scratches." I don't know about you, but daily use of the iPad between my kitchen and office hasn't yielded any battle scars on bare aluminum. Maybe I'm just considerately careful with all of my gadgets, but I feel people are inherently afraid of nothing. I sold my iPad today in mint condition: I'd say my iPad is handled without a case a majority of the time. Now let's return to those wonderful magnets. Via an aluminum binder, Apple has designed the Smart Cover to self align with the iPad 2's chassis. There is quite literally no effort in application -- it's advertised as being "slapped" on and yanked off the iPad with zero fuss. Then there's that satisfying snap as the iPad 2 marries its polyurethane (or leather) companion. It's the most effective reality distortion mechanism Apple's ever invented: it's that sound I think of every time I hear the words, "Smart Cover." In the words of John Gruber, Apple's must-have accessory for the iPad is simply clever. So clever in fact, that the Smart Cover can be folded behind the iPad as a stand for a convenient keyboard lift, or perfect movie viewing angle. In my words, "It's original." Quoting MG Siegler from TechCrunch, it's Apple's every intent to get you to buy one of these things. Everywhere you look on Apple's site, the Smart Cover is shown as being the key ingredient for the success of the iPad 2. Even Jonathan Ive dedicates a significant portion of the iPad 2 video to the features of the Smart Cover. Everything from the microfiber interior to the colors and available materials are accentuated where possible. An interactive animation accustoms customers to how they should use their iPads. This isn't an announcement about the iPad 2. This is an announcement about the Smart Cover with the iPad 2. When has an Apple accessory played such an important role in a product's selling point? I don't know what manufacturers will create for the iPad 2, but I think they're in trouble. Apple is heavily marketing the iPad 2 to be sold in conjunction with their case that's both the bare essentials and the swiss army knife all in the one package. The iPad is being sold in volume starting March 11th in the United States. It will take at least a month for a number of new iPad 2 cases to arrive, but by then most will have purchased the Smart Cover for the iPad. Where will the market be for cases when Apple has already created one that customers are happy with? It's the perfect power play into the accessories department. While the rest of the world concerns themselves in debating about camera specs and dual-core processors, I'm left quite taken back by the simplest of inventions. The aluminum deserves to be bare on your flesh, but you shouldn't sacrifice utility for poor construction. The Smart Cover is a genius re-imagination of intimacy and function for a tablet. Critics will argue you're paying for half of what should be an entire enclosure. Then again, it's the critics who refuse to think outside of the box.